Led by the International Center for Technology Assessment (ICTA), plaintiffs also include Friends of the Earth, Food and Water Watch, the Center for Environmental Health, the ETC Group, and the Institute for Agricultural and Trade Policy (IATP). Based on the scientific literature so far, several hundred products should be recalled due to their toxicity to lab animals and bacteria. Much of the 2011 complaint argues that because nanomaterials are patented, and exhibit novel characteristics unique to their size, they clearly represent new substances requiring regulation and safety tests. Plaintiffs demand a recall on all such products until their safety is proven. Consumer groups including some of the same plaintiffs in the current lawsuit also filed petitions urging nanotech regulation with the Environmental Protection Agency back in 2006 and 2008, reports the Chemical Regulation Reporter. Nanotechnology is the science of manipulating materials on an atomic or molecular scale, measured in billionths of a meter. Nanotech-engineered materials (NEMs) are used in food, cosmetics (including toothpaste and sunscreen), drugs, fertilizers, and home cleaning products with little regulation in the U.S. They are found in ice cream and the coating sprayed on fruits and vegetables, and even line bottles and cans, reported Andrew Schneider in his 2010 exposé on the subject. In June 2011, both the FDA and the EPA issued draft guidelines on NEMs. Though nano-pesticides are already on the market, the EPA made its first approval last month. The Swiss firm, HeiQ, now sells its composite nanosilver and nano-silica for use in clothing (to reduce microbial odor) with EPA approval. Upon publication of the FDA’s voluntary guidlines, the Alliance for Natural Health immediately demanded that nanomaterials be banned from organic certification, as they are in Canada. The FDA has done nothing on NEM regulation since last June. Prior to that, the FDA absurdly denied that any nanofoods were being sold in the U.S.
“Not true, say some of the agency’s own safety experts, pointing to scientific studies published in food science journals, reports from foreign safety agencies and discussions in gatherings like the Institute of Food Technologists conference,” reports Schneider. 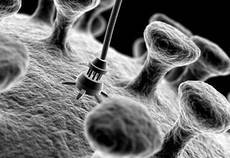 Several of the plaintiffs have issued public reports on nanotech, including IATP. In Racing Ahead: U.S. Agri-Nanotechnology in the Absence of Regulation, IATP notes that as of March 2011, there were over 1,300 products known to contain NEMs. That’s up from 200 in 2006, but the number is conservatively expected to rise to 3,400 by 2020. The ETC Group estimates well over 1,600 products in its 2010 report, The Big Downturn? Nanogeopolitics. The Project on Emerging Nanotechnologies (PEN), a partnership of the Pew Charitable Trusts and the Woodrow Wilson International Center for Scholars, a U.S. government research center, notes that there is no registry of nano-scale ingredients and materials used in products or industrial processes. Meanwhile, some products containing nanomaterials can be found with PEN’s iPhone application for using the Nanotechnology Products Inventory. Despite this, in 2006, the FDA ruled that “particle size is not an issue” for regulation. Basic chemistry teaches the opposite. At that small of a scale, a particle’s electrochemical features more heavily influence its interactions with nearby substances, including viruses, bacteria and DNA. The small nanosize means there are more atoms on its surface than inside the particle. Both the US Patent Office and the National Nanotechnology Initiative, an agency of the US National Science Foundation, refuted the FDA’s stance, explaining that the small size of nanoparticles enable “unique and novel characteristics” that impact not only electrochemical interactions, but also their optical, photoreactive, magnetic, persistence, bio-accumulation, toxicity and explosiveness features. Nanosized aluminum, a suspected ingredient in chemtrails, has been shown to spontaneously combust, reports ETC. Texas-based Quantum Logic Devices holds Patent No. 7,338,711, which is an “enhanced nanocomposite combustion accelerant” used in fuels, propellants and explosives. In addition to several studies showing nanosize-induced harm cited in the 2006 petition, ETC listed ten studies from 1997 through early 2004 that showed DNA and brain damage, lung dysfunction, and bioaccumulation (whereby earthworms and other creatures absorb, inhale or ingest the nanoparticles and pass them up the food chain). Stronger than steel, carbon nanotubes look and act like asbestos, which causes lung cancer. This FOE report also cites reduced kidney growth in lab animals exposed to nanomaterials. By dragging its feet on nanotech regulation for the past several years, the FDA and EPA have allowed the proliferation of nanomaterials into consumer products without disclosure. Similar to the federal government’s refusal to label genetically modified foods, US consumers are once again lab animals for the biotech industry. Hopefully, this lawsuit will spur appropriate safety testing and the removal of unsafe products from the market.